This 5 cd set is something special. With 5 individual jewelcases, packed in lp sized box including oversized booklet this set will bring you back to the old days of cd/vinyl packaging. Something deluxe! 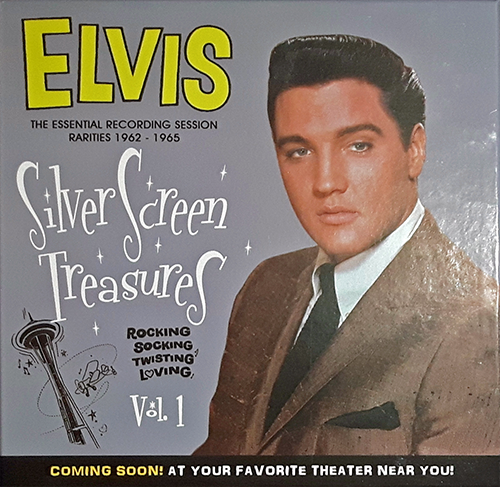 This release features mostly alternate versions from all of Elvis movie sessions during 1962-1965. A fantastic release with a lot of surprises, in a fantastic sound and running order. Last but not least is disc 5, featuring (mostly) rejected acetates of songs written for Elvis movies but (mostly) were never used. A very limited edition so get it while you can. the demo acetates when a new elvis movie was created, colonel parker used to ask several songwriters to write songs for the movie. Mostly the colonel gave them a title or a description of the scene and the songwriters understood what kind of a song the colonel needed. This so called ‘demos’ were then recorded (at expenses of the songwriters) on an acetate disc and sent to the colonel for approval. Obviously there was concurrence between the different songwriters, some of the songs were rejected, Some were actually recorded by Elvis. The actual demos are unique, mostly there were only one or two acetates made and due to the material (wax on a metal plate) they were very fragile and could only be played a few times. This cd contains newly discovered demo recordings, all of these recordings were recorded & written for the elvis movies. Some were not used for obvious reasons, simply because they were not good enough, and some u can actually imagine elvis singing them. Fun in Acapulco is almost a copy of the demo, except for some lyrics that were changed during the recording. Sit back and enjoy! Some of these songs might turn out to be completely different then you expect. I know a few guys and dolls who call it a crap. Not me alone, believe me. I don't see it available on Amazon. Where is it available? We call it a ... crap.